This has been a busy week for Studhubs and I. Getting to the store has proven to be a little difficult. It is in times like this that I am thankful I keep a stocked pantry. No matter what my week looks like, I know there will be something on the table. Because I was so busy yesterday, I had forgotten to set a protein out to thaw. What am I going to make for dinner!?! So I went to the pantry. Canned tomatoes, onions, garlic, pasta. Hmmm...I don't really want spaghetti. This dish was AMAZING and I can't wait share with you how I made it! As always, you will want to start your pasta first. Fill the stock pot with water and add salt. Bring it to a boil, and cook pasta according to the directions on the package. While your pasta is cooking, place two slices of bacon in a cold pan. The reason for this is that we want to render the fat from the bacon, not jut fry it. Cook the bacon until crisp and set aside on some paper towel. Now, to your hot skillet and bacon drippings add the can of tomatoes, juice and all. and the onions are soft and translucent. You will allow that to cook until you can smell the garlic coming from the pan. Time to add the wine. And then add the red wine vinegar. Now you can add the spinach, chopping bacon, thyme, and red pepper flakes to the pan. Place the hot pasta in the skillet as well. This will wilt the spinach. starchy water from the pasta. Taste for salt and pepper, add any if needed. Add the Italian bread crumbs and toast until golden. Sprinkle over top of the pasta. not to mention it is something your ENTIRE family will love! Bring a salted pot of water to boil. Add pasta and cook according to packages. In a cold skillet, place two slices of bacon. Turn on medium/high heat and cook until crispy. When cooked, place on paper towel and set aside. Add the can of tomatoes, brown sugar, and onions to the hot skillet and bacon drippings. Cook until the tomatoes begin to break down and onions become soft and translucent. Add the 1/2 of the minced garlic. Stir and cook until you can smell the garlic coming from the pan. Let the brother reduce by half. Now add the spinach, crumbled bacon, thyme, and red pepper flake to the skillet. Add the cooked pasta to the skillet. Add any salt and pepper needed. In a small skillet add Olive oil and other half of the minced garlic. Add the Italian bread crumbs and toast. 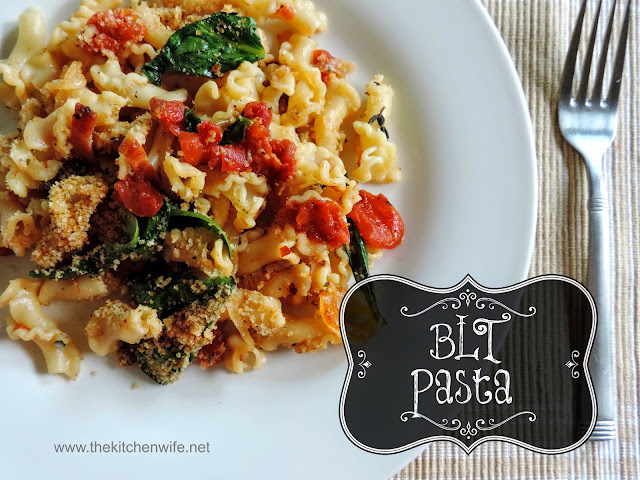 Sprinkle bread crumbs over the BLT Pasta. ** You can omit the wine and use chicken broth instead. *** If omitting the wine, add the broth and one time and reduce by half. **** If you feel that your sauce is a little dry, just add a little of the starchy pasta water.